As we re-built our cottage, pretty much from the ground up, we undertook the transformation not just for ourselves but for an army of family and friends whose names are currently stockpiling in our leather bound guest book. But that's what having a lakeside retreat is all about, right? Sharing. A place that's great for us -- as a couple -- is one thing, but presiding over a destination that's inviting for those who make up our social tapestry is, for us, similarly important. This in mind, the measure of a great retreat -- and its attraction, therein -- often relates to bedroom quotient. Or, as is often the case, the number of beds crammed in to each sleep zone or bunkie, the latter's stack 'em high bunk bed count being crucial. Hey, some cottages, by the time each guest wing or available space is commandeered (er, crammed to the gunnels) could accommodate an entire hockey team. Little surprise then, our interest mooted in a dormer, that our contractor's initial response was so positive. Randy enthused that the extra bedroom would indeed be a useful addition, adding that he'd be delighted to book in, with his wife Tanya, as first guests. The idea of guest accommodation, however, was the last thing on our mind. Plans for our extension, you see, were eminently more selfish: we aspired to an ensuite shower room to service the dramatic attic bedroom revealed during our informative puff in last week's Huffington Post. Played correctly, the shower room's combo of stone, tile, lumber and glass would create a personal eerie of which to be fiercely proud. With three other house bedrooms -- and a four bunk bedded bunkie in the garden -- Grey Gardens already had plenty of crash space. 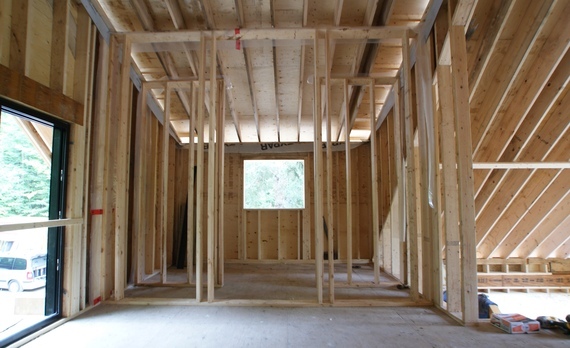 As such, the addition of a shower room was uppermost in our thoughts. What's more, having forged an alliance with realtor Rob Serediuk (host of 'What's For Sale?' on Cottage Life) we were mindful of his advice to make our cottage "market appropriate" with a second bathroom. While we certainly have no plans of selling, it's good to know we've balanced everything should that ever change. And besides, last thing we wanted was a dash between levels every time nature called. Sure, creating the ensuite was a big undertaking but, being that we were re-roofing the entire cottage, it made sense to champion the job concurrently. In this regard, we were afforded the opportunity to auspiciously conceal ducting, plumbing and electrical cabling within new ceiling lines and behind walls. With walls in place and an amazing elevation of Rebarn vintage doors waiting to slide in a glorious woody sweep, we divided the space into a shower cubicle, a focal point sink area and a walled off toilet, modestly tucked to one side. The barn doors proffering a semi-open concept feel (between our new wash zone and bedroom) the idea was to create a stylish intersection where design 'mediums' would merge. The transition of flooring is a perfect example -- in the bedroom, wide plank oak Kentwood Barbican boards yield to timber effect ceramic tiles from Saltillo -- the former is the real woody deal while the latter tiled pretender is an entirely waterproof "interpretation." 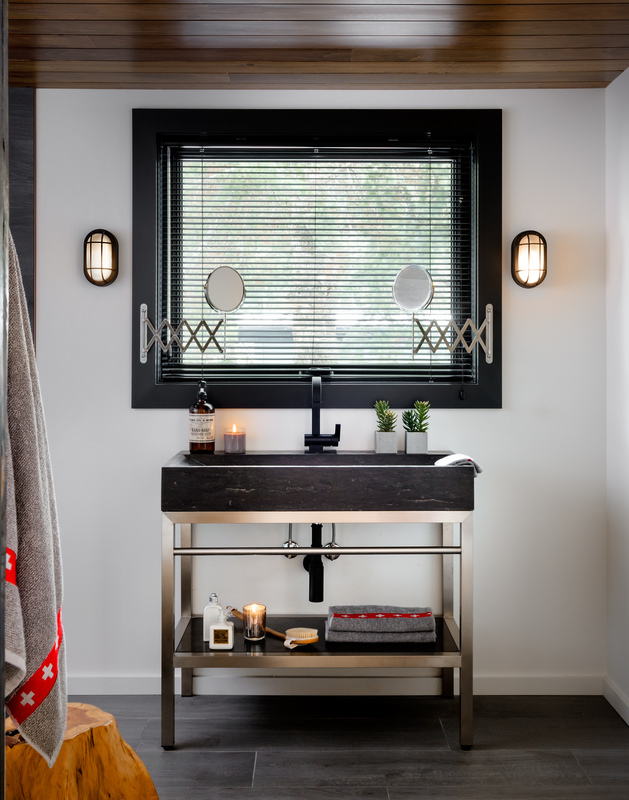 Positioning a vanity in front of a window does present certain challenges, but by installing retractable wall mirrors from Ikea paired with bulkhead wall lamps (a steal from the outdoor section in Home Depot) either side, we're assured of a well lit place for shaving and teeth cleaning. 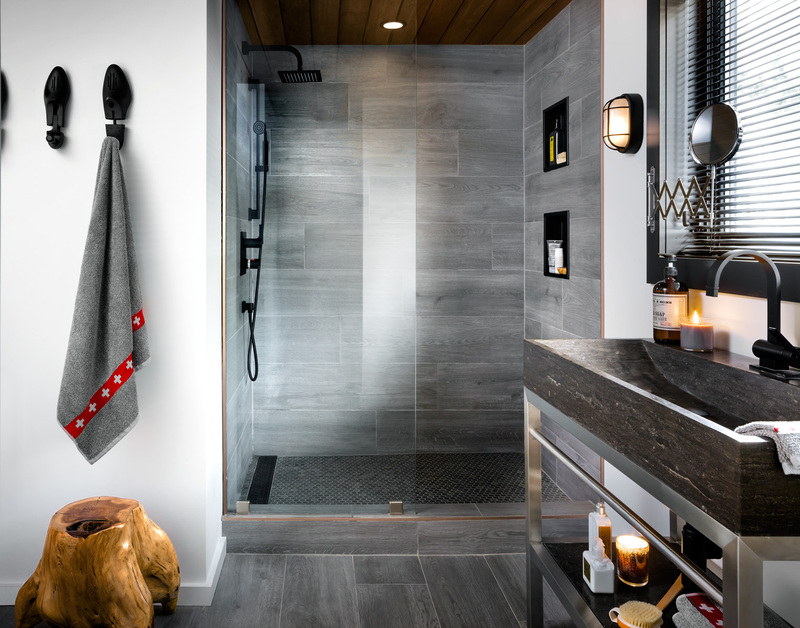 With the emphasis on "four seasons," under floor heating allows us to pad about barefoot in the winter -- without the slightest fear of frostbite -- while the double glazed window baffles even the coldest chills. We wintered in Haliburton last year (from, ahem, late September to early May) and really reaped the benefits. Walls and flooring attended to, we turned our attentions overhead with a wooden ceiling that takes its style cue from the connecting bedroom. Having stained budget pine to resemble walnut, our decorator Mike applied two even coats of low sheen varnish -- to inhibit water absorption -- and the installation was complete. If you follow our work, you'll know we love to spend on build quality. But you'll also know we love to save by shopping in thrift stores and antique barns for items to upcycle. The trio of ten buck wooden shoe molds are a great example: found in an antique hall, sprayed black to match the windows and then hung in a row, they provide whimsical positioning for the cross-detailed Drake General Store towels. Visit and discover a fun inventory of curious, gifts and home styling. As always, we hope you'll be inspired by our transformative endeavors. 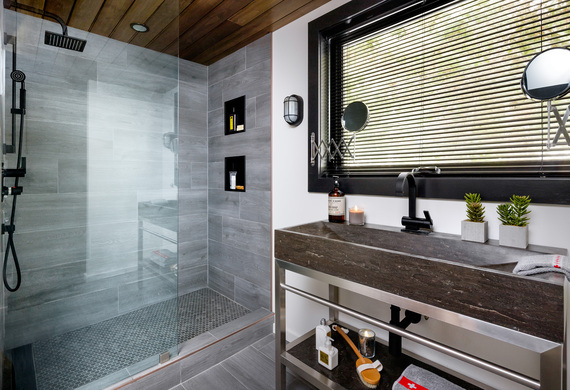 Okay, so extra bedrooms are all very well, but a dreamy bathroom is a personal luxury. Should you crave even more inspiration, we'll leave you anticipating next week's before and after: a kitchen composed with acres of washy grey Caesarstone and shiny white Ikea cabinetry: it's a joy to behold.